A full fitness and beauty regime includes pampering your body daily with internal and external MethylSulfonylMethane. Treat your body to the most nutritional soothing, and smoothing skin lotion to be found. 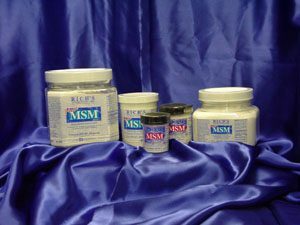 Rich’s MSM Lotions contain the highest percentage of MethylSulfonylMethane on the market. It has been suggested by one of the world’s most prominent atmospheric chemists that MSM and its related compounds, DMSO (dimethylsulfoxide), and DMS (dimethylsulfide) provide the source for 85% of the sulfur found in all living organisms. The cycle of these naturally occurring sulfur compounds begins where microscopic plants and animals called plankton release sulfur compounds called dimethylsulfonium salts. These salts are transformed in the ocean water into the very volatile compound dimethylsulfoxide (DMS) which escapes from the ocean water as a gas and rises up into the upper atmosphere. Here, in the presence of ozone and high-energy ultraviolet light, the DMS is converted into its cousins DMSO and MSM. Unlike the DMS, both DMSO and MSM are very soluble in water, and they return to the surface of the earth in the rain. Plants take up the two compounds very rapidly in their root systems, concentrating them up to one hundred fold. MSM itself and the sulfur it contains are incorporated into the plant structure. Through the processes of plant metabolism the MSM, along with the other sulfur compounds it has spawned, are ultimately mineralized and transported back into the sea, and sulfur cycle begins again. MSM is a nutrient and a normal metabolite, or byproduct of dimethylsulfoxide, better known as DMSO. Chemically, MSM is DMSO with one added, stabilizing atom of oxygen onto the sulfur, i.e., CH3 SO2 CH3. Being ubiquitous to the diet of all vertebrates, MSM (and precursors) derive from vegetables, fruit, fish and meat. Any processing of a foodstuff, even the drying of, may drive off a portion of the fugitive MSM. Physically, MSM is an odorless, white crystalline, water soluble molecule. Interestingly, one of the richest sources of MSM in the diet of mammals is milk. “While MSM, recognized as a normal dietary factor of vertebrates, should be considered in the dietary factor category, it possesses certain bio-medical properties similar to DMSO together with additional biological activity not possessed by DMSO. It is most interesting that MSM has no exceptional activity, in vivo, where biological normalcy is presented. The original paper on the subject referenced MSM as factor N, implying the property of returning the abnormal health state to normal”. Excerpt from “MSM” by John Metcalf, D.V.M. Yet ironically while sulfur is clearly essential for health, it is not officially regarded as such by the US Academy of Sciences, which establishes nutritional recommendations for the FDA. In addition, sulfur, per se, has been one of the least researched nutritional minerals. MSM is no more toxic than water. Any excess MSM in your system will stay in the blood stream for 12 hours removing toxins and cleaning the interior walls of arteries. Food refining and processing removes MSM much the way they reduce Vitamins and Minerals. When we process our foods with heat or drying, we lose most of the MSM that is vital to our well being. MSM helps our bodies utilize the vitamins that we take, thereby providing the means to derive the maximum benefit from them. MSM is a natural form of organic sulfur found in all living organisms, and is present in low concentrations in our body fluids and tissues. It is a natural component of many fresh fruits, vegetables, seafood and meat. It is also found in tea, coffee, chocolate and milk. However, unless your diet is composed primarily of raw foods, it is unlikely that you are receiving enough MSM for proper health management. When taking MSM, it is suggested that Vitamin C be taken also. MSM needs the Vitamin C to help it build healthy cells. One in five may experience negative detoxification symptoms in the first 1-10 days during which toxins are flushed from the system. Symptoms may include diarrhea, skin rash and/or possible headache along with several days of fatigue. In general the more intense the symptoms, the more toxins there are in the body, and the more MSM is needed for detoxification. To reduce toxic symptoms (if you suspect Candida or metals) start with a lower dose of 750 mg, two times a day and build up to 3,000 mg. twice a day. Kornax 2 lb. of 100% Pure MSM Crystals for – $19.95! MSM: The Forgotten Nutrient by Dr. Beth M. Ley for ($3.95). Rich Distributing is not directly affiliated with Kornax Enterprises, L.L.C.